Michelle S. Drummond a Jamaican expatriate came to the United States in 1995 as an international student to pursue her education at St. Lawrence University in Upstate, New York. While pursuing a Bachelor’s of Science degree in Mathematics at St. Lawrence, she decided to explore fine arts as a creative outlet. After dabbling in the different offerings of fine arts, Michelle discovered that manipulating multicolored strings using glue and acrylic paint on canvas was a different and exciting take on expressing her creativity. Drummond is one of 29 artists selected to show her work at SOCIAL CODE a juried exhibition of new works by local, state and national artists selected by guest curator Nichole Hickey. 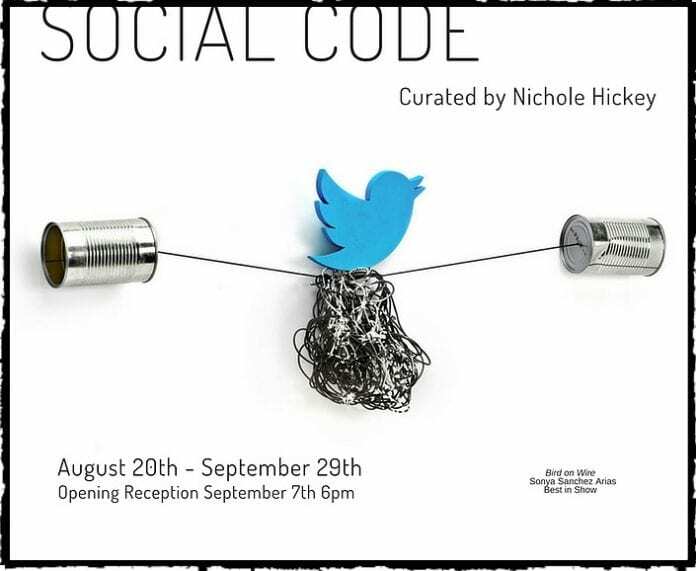 Social Code exhibition is varying interpretations of the idea of Art versus Social Media. Works selected encompass all a variety of mediums, both 2D and 3D pieces making her a natural fit for the exhibition. The concept of the show is to demystify Art vs. Social Media as written about by Ben Davis, to create a social networking art show, and to provide artists an opportunity to show their work at the Arts Warehouse at 313 NE 3rd St, Delray Beach. The exhibit has been on view since August 20th and will run through September 29th, with the opening reception taking place this Friday September 7th 6 – 9pm during First Friday Art Walk. Within the same Arts Warehouse facility hosting the exhibition, Drummond has also secured a space under the name of her art business DStrings to showcase her body of original artwork and by subsets of the original artwork, such as framed prints and embroidered polo shirts. Art enthusiasts are welcomed to stop by to view and purchase products. Drummond has also achieved a Masters in Project Management and established her own business, The Drummond Group, LLC, along with DStrings, LLC.